Your resource for everything from the ELD Mandate to what to look for when purchasing Electronic Logging Devices. Take a complete look at different ELD topics with Insights (also known as White Papers). Watch videos to learn more about ELD topics that affect you and your business. Read quick topics like ELD pricing or the consequences of not using ELDs. Businesses that fall under the rules of the ELD mandate are now required to have their trucks equipped with either a certified ELD or AOBRD. While the FMCSA announced that it wouldn’t be placing non-compliant vehicles out of service until April, fleets aren’t getting a full pass for not complying. Fleets may be able to keep their vehicles in service but will face expensive consequences. Before you choose an Electronic Logging Device (ELD) solution or devices, review the ultimate ELD checklist. 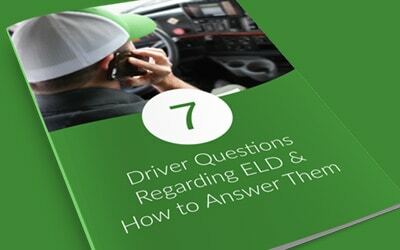 This checklist includes the Federal Motor Carrier Safety Administration’s (FMSA’s) regulations regarding the information ELDs must gather, required ELD features and functions, and other important factors to consider about the technology and provider. As your drivers shift from using paper logbooks to Electronic Logging Devices (ELDs), they will undoubtedly have many questions for you about the technology and how to use it along the way. The Federal Motor Carrier Safety Administration (FMCSA) website has provided guidance on the top questions managers of regulated fleets should expect to receive from their drivers to help you through this transition. Electronic Logbooks: Why Partner with a Telematics Provider? Partnering with a Telematics provider that offers Electronic Logging Devices (ELDs) can make the process of using this mandated technology much simpler and more effective. Telematics providers are fleet experts. They are experienced in small to large-scale device implementations, their products will be continuously up-to-date with technical ELD requirements, and provide ELD-specific support. For businesses still looking for “an out” from the ELD mandate, the Federal Motor Carrier Safety Administration (FMCSA) has outlined some exemptions and exceptions to their rule. Although these exceptions exist now, keep in mind that they will not exempt your fleet or drivers indefinitely. According to the FMCSA’s guidelines, the following drivers will be exempt from using electronic logs. There are two main options to comply Electronic Logging Device (ELD) Mandate, Bring Your Own Device (BYOD) or vehicle-installed ELD. BYOD refers to companies or employees using their own smart devices and downloading a HOS app opposed to an HOS-dedicated device that is installed into the vehicle. There are key differences that could sway your choice of which is right for your business. Switching from Paper Logbooks to ELD? There are no official guidelines from the Federal Motor Carrier Safety Administration (FMCSA) about how to make the transition from paper logbooks to ELDs. To help your team during this paradigm shift from paper logs, pick the right ELD provider that offers ample support to your team, ensure you and your drivers are trained to use the technology, and prepare your administrative team for how it will change how they operate on a day-to-day basis. What Happens When You are NOT ELD Compliant on December 19th? The first question most fleet managers and owners have about the ELD mandate is, “how much does ELD cost?” The Federal Motor Carrier Safety Administration (FMCSA) conducted a study to find out the costs associated with the mandated technology. The FMCSA estimates the cost of an ELD is $495 per year or $41.25 per month per truck. ELD vendors range in cost from $165 to $832 per year. The Electronic Logging Device (ELD) Mandate is now in effect. Simultaneously, we also know the financial consequences associated with failing to comply with the regulations. There are many aspects to an ELD implementation including installations, training, and maintaining electronic logs. That’s why it’s crucial to make sure you have two different layers of support. The first comes from your electronic logging provider. The second is a point person in your organization that can help answer questions. If your vehicles are found to be operating outside the new ELD regulations, your business is subject to penalties that range from receiving large fines to having your vehicles placed out of service.